Another Republican in the U.S. House — Speaker Paul Ryan, no less — announced his intention not to seek re-election in 2018, adding to the number of members leaving ahead of what’s expected to be an unfavorable mid-term environment for the party. Even before Ryan’s announcement, HuffPost reported that the number of GOP congressmen leaving the chamber, either for retirement or other offices, has hit numbers not seen in decades. His exit is likely to increase that number soon. Yesterday I mapped the more than 350 “majority minority” counties in the United States, breaking them down by race and ethnicity groups and geography. As promised, today I’ve looked at how these counties (in the contiguous United States) voted in the 2012 election. That map, of course, can be misleading — as often happens in elections. That because the area of the counties can distort their actual voting power. 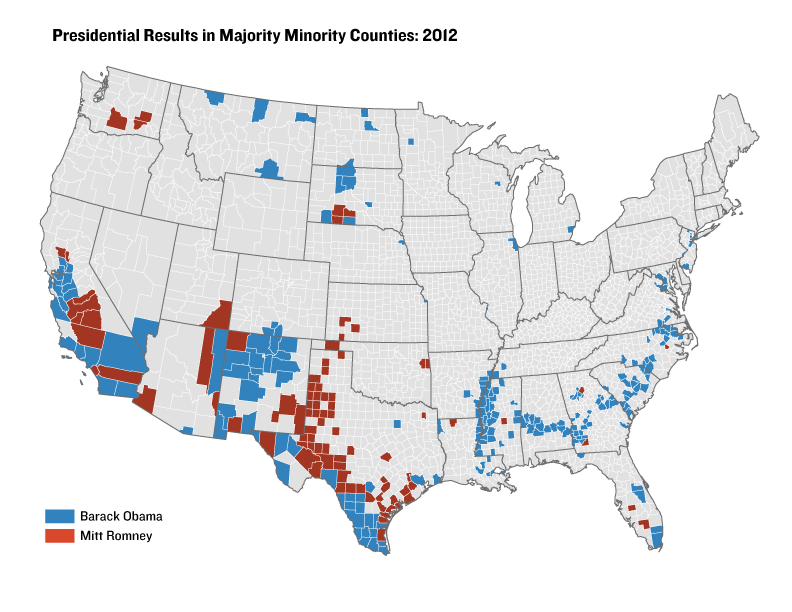 In this case, Obama won more “majority minority” counties with urban populations and many more voters, such as Los Angeles (Calif.), Cook (Ill.) and Kings (N.Y.) counties, among others. Romney carried rural Republican counties, largely in Texas and the west. 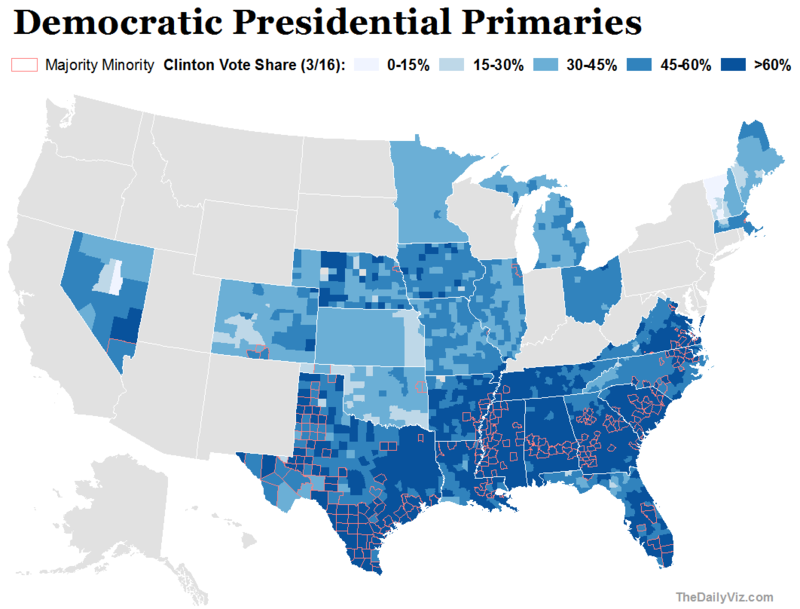 Obama received nearly 18 million votes in the “majority minority” counties he carried. 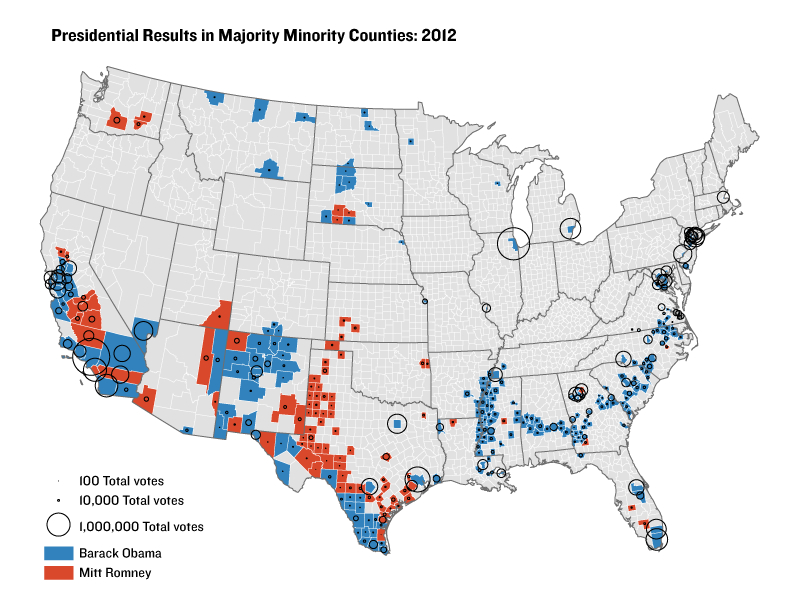 Romney got 2 million votes in his “majority minority” counties. In the end, Obama received a net 10 million votes from “minority majority” counties — nearly double his national margin over Romney in the country as a whole. The map below uses proportional circles on top of the choropleth map above to help visualize the total votes in each county. 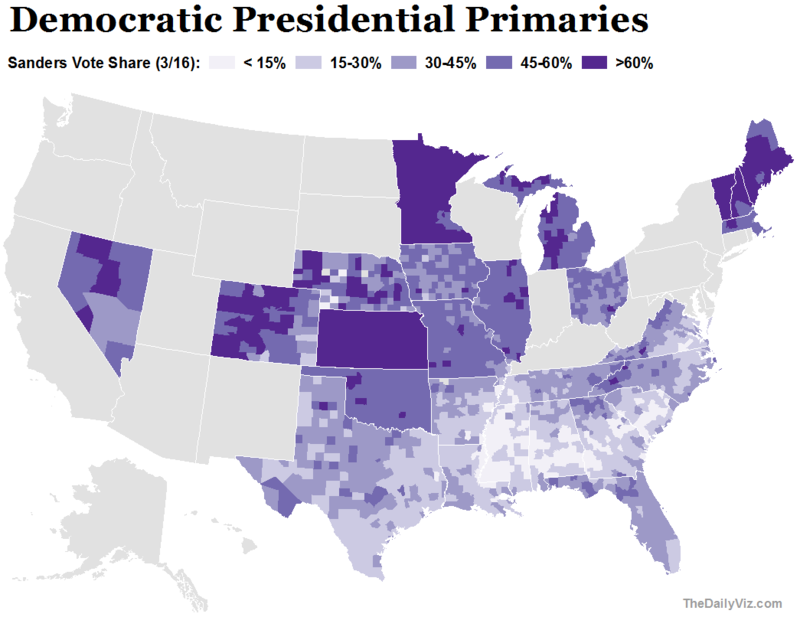 You can see how Obama won in many of the most-populous counties, increasing his national margin (though not necessarily helping with the Electoral College — except in critical purple states he carried, such as Florida and Virginia). You can download the data here. The New York Times created two nifty interactive bubble charts to represent the frequency of words used at the respective political conventions. We’ll see what this looks like after Thursday night. When it comes to cars, the results are often predictable. It probably won’t surprise anyone to learn that the data, as collected by Scarborough Research, show that drivers of hybrid automobiles tend to skew Democrat and are highly likely to vote. Subaru owners, as well. Saab and Volvo owners also lean left and vote in large percentages, though not by as wide a margin. Tonight President Obama gives his third “State of the Union” speech, an address that dates back to George Washington. Over time, the length and format of the speech has changed, according to the The American Presidency Project. Bubbles in this view are sized the represent the number of speeches given by each president, with colors representing format (purple = oral; green = written). This shows the total number of words used during each president’s tenure in both formats. Teddy Roosevelt needed 174,000 to deliver his thoughts, leading all presidents. A better view is to look at the average number of words used, given that presidents have had varying term lengths over time. Jimmy Carter led all presidents, with an average of 33,000 words, though that’s skewed by one long written address as he left office. Bill Clinton had the longest average oral speeches since 1966, at 1 hour and 14 minutes. Richard Nixon gave the shortest speeches, averaging about 35 minutes. Taiwanese voted on Saturday for their next president and parliament, an election being closely monitored by China and the United States as they look for stability in the region at a time of political transition for both superpowers. The votes will be tallied overnight, but I mapped the regional divide from the last election, in 2008, which propelled nationalist Ma Ying-jeou to power. His Kuomintang party has pushed for warmer relations with China. Four years ago, he defeated Frank Hsieh, of the Democratic Progressive Party, which favors independence from China and a distinct identity from the Middle Kingdom. We’ll see what happens in the morning in the contest between Ma and pro-independence DPP candidate Tsai Ing-wen. Though Ma won easily four years ago, this year’s contest is too close to call. This time, a third-party candidate, James Soong, is in the race. He threatens to pull votes away from Ma’s party, as he did in 2000.